Cut vehicles are vehicles or variants of the vehicles that were not made available in the final release of the game. Unavailable vehicles also includes vehicles that can be spawned into the game but are never seen in the game at all. Unavailable variants of vehicles includes different paint jobs and style of the vehicles. These are vehicles that were deleted or cut before the games' release and cannot be spawned through third party trainers or cheat device. Several unnamed cars never appeared in the final version. An Army helicopter was cut. 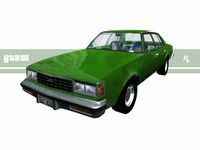 The Brigham was a green car that was featured in pre-release renders of GTA III. It was based on a 1977–1979 Chevrolet Caprice (despite the name implying a Cadillac (Fleetwood) Brougham); having the older bumper style compared to the Las Venturas police car from GTA SA. The Diablo Infernus was a variation of the Infernus which supposedly was to be driven by the Diablos. It was removed because it may have been too fancy for Portland. The Luton, a box van, which the model's cargo compartment later became the basis for the Mules. It was cut from GTA III. The Panto was another vehicle that was cut from GTA III. The car was planned to be a four-door sedan similar to Fiat 128. The school bus was meant to be appeared in GTA III but it was likely removed due to the absence of children in the game. Remnants of the Coastguard Maverick include an entry in the handling file (COASTMAV) and an entry in the text file (COASTMA). Nothing else is left of this vehicle and based on those two evidence, the vehicle is most likely a helicopter used by the Coastguard. The Police Helicopter from GTA III was meant to appear in Grand Theft Auto: Vice City, but cut during development. This is evidenced by the handling files, and it is probably replaced by the Police Maverick, making it a leftover from GTA III. The GTA III Subway was meant to appear in GTA Vice City but cut during development. This is evidenced in the handling file, with possibly no replacement. The Dodo was meant to appear in GTA Vice City but cut during development. This is evidenced in the handling file, possibly replaced by the Skimmer or a leftover from GTA III. The Kuruma from GTA III was going to be included but cut during development. This is evidenced in the handling files and it is probably replaced by the Washington, making it a leftover from GTA III. The Toyz van from GTA III was to be included but it was cut and replaced by Top Fun. A civilian version of the Patriot was meant to appear, but it was reworked to an army Patriot. Many previews published before the game's release told of about 425 vehicles included in-game. The plane previously seen in Vice City and Liberty City was replaced by the AT-400. Untextured model and handling still exist. Both Bloodring Bangers were planned to appear in GTA San Andreas. Only the "bloodra" (based on the Glendale) is featured, the models and handling of the "bloodrb" (based on the Oceanic) remains. An FBI Car view through a program in GTA San Andreas. The FBI Car was cut from GTA San Andreas. It was similar to the Las Venturas Police Car, but had a different grille. The model was featured in an unused cutscene. A totally new vehicle. Despite its name, it does not seem to be a boat. It appears to be a train. Another new vehicle. Nothing is known about it but its handling, which is very similar to the Caddy's, implying this was meant to be a second golf kart. A cut weapon in GTA San Andreas but also a vehicle. It was cut during the development of the game and was planned to be introduced in the mission Madd Dogg's Rhymes. The HUD icon is the only remnant of the skateboard. The famous boat from Vice City was meant to come back in San Andreas. Apart from the handling, there are no leftovers. It was probably a customized Stallion or a Shelby GT500. A fast car which was cut during development. Nothing is known about it. Appears in handling file as possibly leftover of GTA Vice City engine. It was probably a car used during the mission L.C. Confidential. According to text file, the Toyota Supra was going to appear, possibly referring to the Jester. A fast expensive car based on the McLaren F1 LM. Not to be confused with GTA Vice City protagonist Tommy Vercetti, the Tommy was a small car based on Austin Mini. Japanese car based on Nissan Skyline GT-R. According to text file, the Subaru Impreza WRX was going to appear, possibly referring to the Sultan. A new boat which was cut. It was still listed in the official game guide, but its picture was replaced with Speeder's, so nothing is known about this boat. The same remnants of the Coastguard Maverick from GTA Vice City appears here. They are most likely leftovers from GTA Vice City. A comeback four-door sedan in GTA III and GTA Liberty City Stories, but it was cut probably for being too modern for the 1980's. An unnamed motorcycle (possibly a different Streetfighter or PCJ-600) was cut. The Andromada plane from San Andreas was cut in the early development of GTA IV. Only the handling remains. According to audio files, the Buffalo was a cut car until The Ballad of Gay Tony. The FIB Buffalo appears though. According to some hidden audio files, the golf cart was already planned to be available in GTA IV. Its appearance was also delayed until The Ballad of Gay Tony. The Coach was cut during the development of GTA IV; however, it can be seen in the Higgins Helitours commercial. This second plane was also cut from GTA IV, the handling can still be found in the game files. The NOOSE variant of the Boxville can be seen in the background of an early GTA IV screenshot. The Fighter was a plane meant to make an appearance in Grand Theft Auto IV but was removed. The only notable remnant left in the game is its handling line. This car from GTA San Andreas could appear in Liberty City. It has possibly become the Faction, as they are both based on G-body Buicks. Only few audio files still exist. The Previon from GTA San Andreas was meant to return in Grand Theft Auto IV, but only some audio files remain. It could have served as the basis of the Hakumai's design as both cars are based on similarly styled Hondas. Eight chopper motorbikes, finally made available in The Lost and Damned, already had their model and texture in GTA IV. They can be used ingame like normal bikes with help of modifications. An unnamed SUV that does not appear in GTA IV can be seen on the television in-game. It appears to be similar to the Huntley of GTA San Andreas. A different Admiral (internally named "admiral2") was meant to be featured in The Lost and Damned. It is believed that this was going to be the old Admiral (based on a Mercedes). Very few files still exist. The same as the above, however there is no clue about the differences to the basic truck. The Rhino tank was cut from the final version, although some files still exist. It is possible that it's design was given to the APC or it may have been a completely different design. A small new car. Its only leftover is the handling. Its name was probably derived from the three-wheeled Reliant Robin car. A large truck similar to the Noose Enforcer and Securicar. Being an armored car, however the Brickade is designed for monetary transport only, and its design is primarily based on a Progesur armored vehicle. Its horn is derived from the FIB Buffalo, however its only similar when an FIB agent or LCPD officer drives it and is blocked by the player. Its model and texture are in the game's files, and can be put into the game via mods. It is obtainable on Xbox 360 consoles through the use of mods or a modified save game file. No known method for obtaining the Brickade has been found yet for PlayStation 3. The Hunter can be seen in 2 videos in-game, and is listed on Warstock Cache & Carry's Lifeinvader page as an Attack Helicopter. There's also a unused vehicle weapon for it named VEHICLE_WEAPON_PLAYER_HUNTER. Left in a texture and not used in game, there's a picture of an updated version for V.
They were originally planned to be in V and be ride-able, but were cut. Many files for horses still exist and it can be seen in a commercial on Weazel. The Uranus was cut from the original game. Its only leftover is its handling data. A heavy, slow car that was cut. Its only leftover is its handling data, that was also in Max Payne 3's handling.dat listed under Jimmy Vehicles. A small helicopter that was cut. Its only leftover is its handling data, that was also in Max Payne 3's handling.dat listed under Jimmy Vehicles. A small ultra-light aircraft, possibly an updated Little Willie. Its only leftover is its weapon handling data, that was also in Max Payne 3's handling.dat listed under Jimmy Vehicles. It used the cut Hind Gun and Hind Rocket weapons. Two near identical very lightweight, fast and highly maneuverable aircraft. Both used the weapon VEHICLE_WEAPON_ENEMY_LASER. Their only leftover is handling data. A picture in Simeon's Premium Deluxe Motorsport dealership of a cut red SUV labeled HNR, and looks to be based off a Chevrolet HHR. Seen in the first trailer. This was added in the PC/NG versions of Grand Theft Auto V as the Dodo Seaplane. Seen in the first and second trailer, in the Cunning Stunt Academy commercial on CNT, in a Righteous Slaughter 7 loading screen  and in the game's files. The Vulkan is a state-of-the-art fighter jet  that's VTOL  and has mounted machine guns and rockets. This was later added in the Heist Update. The Rhapsody was cut from the original game. It was later added in the "I'm Not a Hipster" Update. An attack helicopter that was cut. Its only leftover is its handling data, that was also in Max Payne 3's handling.dat listed under Jimmy Vehicles. It used the cut Hind Gun and Hind Rocket weapons. This may have been added as the Savage in the Heist Update. An attack helicopter that was cut, it has identical handling as the Hind. Its only leftover is its handling data, that was also in Max Payne 3's handling.dat listed under Jimmy Vehicles. It used the cut Hind Gun and Hind Rocket weapons. This may have been added as the Valkyrie in the Heist Update. These are the vehicles that had their names cut and changed before the games' release. Other than the name, there were no major changes to the car itself. 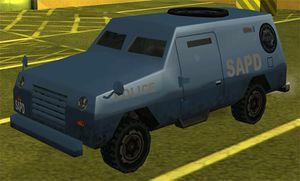 An FBI Truck in GTA San Andreas, available only through trainers or modifications. Similar to the deleted vehicles but the difference is that they can be spawned through mods or cheat devices. A remote controlled vehicle that is disguised as a pot. It is never used in the game, is ridable and can support two people. Appears only during Zero's cutscene in mission Wear Flowers in Your Hair. It does not appear anywhere else, but can be spawned via trainers. Additional modifications are needed to control the helicopter. An APC that was cut before the game's release. It was planned to appear in the cut mission The Truth is Out There. A trailer that can be attached to Utility Van. It is unknown why it does not appear in regular game. The famous small plane from GTA III could be reintroduced in GTA Liberty City Stories. It can be spawned via trainers, but the lack of acceleration renders the plane useless. It doesn't have in-game name. The Hunter is the proof that GTA Liberty City Stories was made using the GTA Vice City engine. This helicopter can be spawned using trainers, and has working weaponry, but does not have in-game name and cannot be used in Vigilante missions. Both remote controlled helicopters appear in GTA Liberty City Stories files, possibly as leftovers of GTA Vice City engine. They are never used in-game and can be spawned via trainers. Same as the Hunter, but lack of acceleration again renders the helicopter useless. The FBI Rancher was cut for being too modern for the game's 1984 setting. However, it can be spawned through cheat devices. The VCN Maverick was cut or is a leftover from GTA Vice City engine. However, it can be spawned through cheat devices. The Tampa was originally supposed to spawn around Liberty City. Now it is seen only in the introduction cutscenes. It is available to drive in The Ballad of Gay Tony. A stumpy looking truck that was cut. It can be obtained through modifications and downloading save files. Wrecked version of the Police Cruiser. It does not appear in any mission and can be spawned, driven and damaged like a normal vehicle. These are vehicles that were changed or their colors cut during development. A few of these are aesthetic changes, includes removal of rims, spoilers, etc. Some beta models can be obtained through Cheat Devices while others can not. During development of GTA 2, vehicles used different styles. Many cars had different rims. Most cars from GTA Vice City were identical to that rendition (Walton, Greenwood, Sabre, Oceanic, Admiral, etc). The Bullet had a different look. Instead of one hood scoop, it had two. The Clover had different taillights. The Hydra originally was very different; the full beta picture can be seen in the Zero RC shop. The Savanna had a different grille, different rear bumper and only 2 doors. The Jester had a different front bumper. The Landstalker roof and design was flatter than the final design. A very early screenshot showed a Sparrow in place of a Police Maverick. Some believe that either the Maverick model wasnt finished yet, or at one point the Sparrow was going be used as a second Police aircraft. The Combine Harvester originally had a green body color, no stepbars into the driver cab, and a less detailed combine head. The HPV-1000 had different decals. The Stratum had en emblem on the hood. The Fortune had different headlights. The Sanchez was similar to the Vice City rendition. 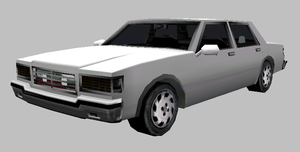 The San Fierro Police Car (and possibly the Premier and the Taxi) had a closer resemblance with a Chevrolet Caprice with a different grille, rounded "beached whale" design, and it also features the skirted rear fenders of 1991-1993 Caprices. The model was featured in an unused cutscene. The Journey had a different yellow and blue stripe vinyl. Each city had its own Police Maverick and police bike. The Taxi was identical to its Vice City rendition. The Elegant's appearance was featuring a gray bumper (oddly, the rear bumper's color matches that of the body) and a simpler lower mask. The Freight had a boxcar variant. Originally, the Police was similar to pre-9/11 police cars but it was changed back to police cars similar to GTA III. The PCJ-600 was similar to the Vice City and San Andreas rendition. Also there was once a golden PCJ 600 but was cut. There was an orange Landstalker that was removed. There was a blue Perennial that was also removed. The Cholo Sabre was once colored blue at the early stage of the development, but was changed. Also, the car was colored white with stripes later. The Bovver '64 originally didn't have a rollcage. The Armadillo didn't have back doors on the sides. The Enforcer was going to share chassis with the Boxville. The Taxi had a black variant. The Contender had different styled wheels. The Merit had a different grille and headlights. The Annihilator was missing a yellow stripe. The Marbelle looked more like the Ford Granada it was primarily based on. The Packer's ramp could touch the ground. It never appears in-game but it can be spawned with third party trainers. The Turismo had a different grille. Also it could have rear spoiler later. The Police Cruiser had registration number on the trunk. All Squalos had a blue color scheme. The Stretch had a different grille. The Super GT had decals on its rear. The Maverick had a two-blade rotor and closed rear doors. The Schafter had a grille-mounted Benefactor emblem, like the Mercedes-Benz it is based on. The Daemon, the Diabolus, the Hexer, and the Nightblade had their names written on them. The Angel had side panniers, like in GTA Vice City. The Skylift looked more like its real-life counterpart, the Sikorsky S-64 "Skycrane". There was originally a version of the Bodhi that was different from Trevor's Bodhi. There was another Comet model, most-likely without a spoiler. There was originally 2 different Elegys. There was originally another Feltzer, most-likely a non-tuned version. There was originally another Issi, most-likely a hardtop variant. There was originally another Voodoo, most-likely a clean version. There was originally another Schafter, perhaps more like IV's or TBoGT's version. There may have been another Taxi. The Tractor was slightly shorter. ↑ Post on Warstock's Lifeinvader page. ↑ 0xB2298C99 in global.gxt2: A state-of-the-art fighter jet with air-to-air missiles fitted on each wing, the Vulkan is the Rottweiler of dogfighting. ↑ Handling, Model, Texture and gameName used for Injection. Can be seen in vehicle.meta. ↑ Handling, Model, Texture and gameName used for Mallard. Can be seen in vehicle.meta. ↑ Handling, Model, Texture and gameName used for Dashound. Can be seen in vehicle.meta. ↑ Model and Texture name used for Roosevelt. Can be seen in the Valentines DLC's vehicle.meta. ↑ Handling, Model, Texture and gameName used for The Liberator. Can be seen in the Independence DLC's vehicle.meta. This page was last modified on 11 June 2015, at 19:17.